Mae Hong Son is facing dangerous air pollution, with PM2.5 levels reaching a critical level. Late on Friday, the amount of PM2.5 – particles of no more than 2.5 millimetres in diameter – in this northern province reached 124 micrograms per cubic metre of air. The safe limit of no more than 50 micrograms per cubic metre of air. Mae Hong Son Public Health Office has warned that the air pollution levels in the province are dangerous. “The smog situation is worrying. People, in particular the elderly and young children, will face health impacts,” it said. It urged locals to see a doctor if they have difficulty breathing after getting exposed to smog. “If you can see just a few electricity poles in front of you, it means smog is serious,” the office said, offering a tip on how to check the severity of air pollution. 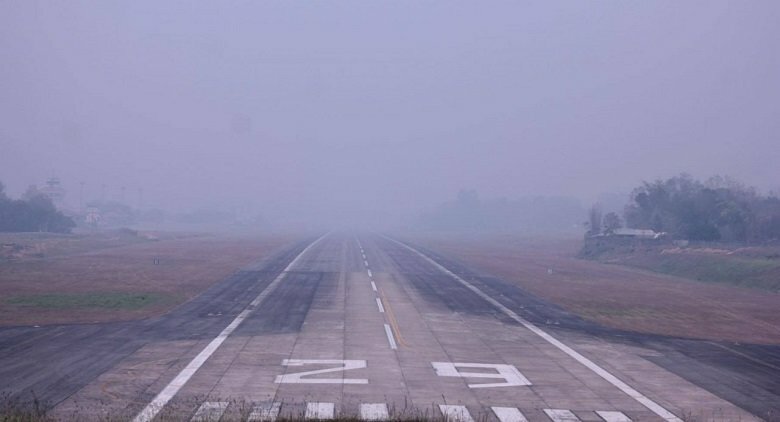 Nok Air has now joined Bangkok Airways in cancelling their flights to and from the Mae Hong Son Airport because the air pollution has affected visibility. Relevant authorities have blamed the thick haze on forest fires. 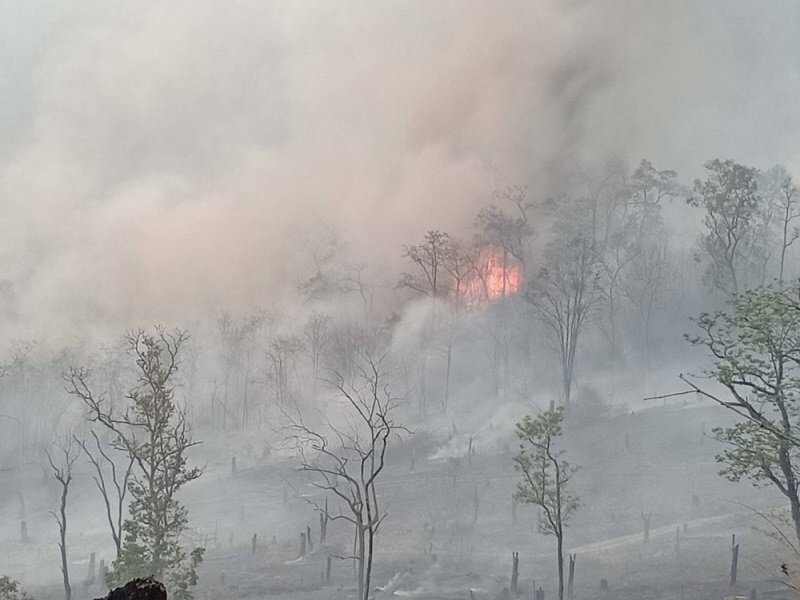 As many as 250 hotspots were detected in Mae Hong Son on Friday. It took time and several people to extinguish each fire. An informed source said the prevalence of forest fires stemmed partly from authorities’ focus on fire extinguishing, rather than fire prevention. 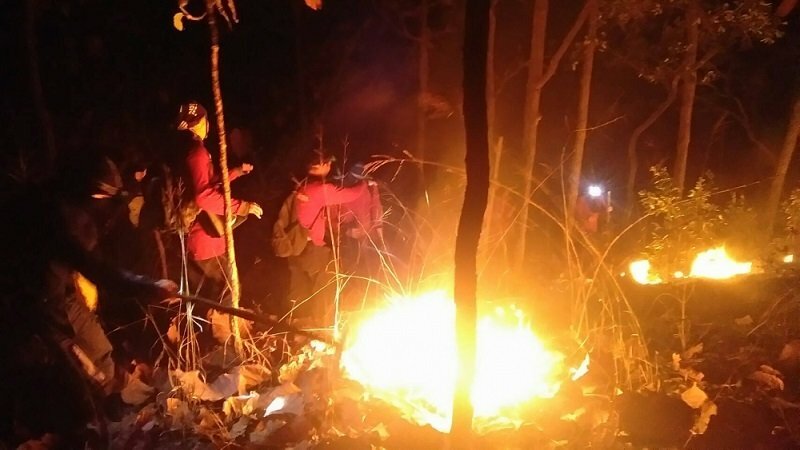 “I have noticed that whenever authorities increase the budget for fire extinguishing and announce a crackdown on people foraging forest produce, the number of forest fires rise,” the source said. Speaking on condition of anonymity, he said many locals resolved to not lend a hand when a forest fire started because the budget for the cause was not shared fairly. “In 2017, Mae Hong Son received Bt65.6 million for efforts to fight forest fires and smog,” he said. This is a major disgrace, and a vivid illustration of how totally ineffective the junta has been in reducing the continuing very dangerous levels of PM2.5 in the North. PS there is no 'safe limit'. When people choose to burn their own countryside something is seriously wrong. Sadly, as it does not effect Bangkok, nothing will be done. "The safe limit of no more﻿﻿﻿﻿﻿﻿﻿﻿ than 50 micrograms per cubic metre of air﻿﻿.﻿﻿﻿﻿﻿﻿﻿"
You should try looking at Bangkok's air quality forecasts sometime. "It urged﻿﻿ locals﻿﻿﻿﻿﻿ to see a doctor if they have ﻿difficulty breathing after getting exposed to smog.﻿"
Sure, this will fix everything. Aren't there some pills for that? I guess I'm "making lemonade" with my disappointment with the Thai smog. 5 or 6 months in Chiang Mai, 7 or 6 months in perhaps Eastern Europe where I've never been, or a few countries possible in Western Europe - I'm looking forward now to half a year of exploring every year. Shameful, shameful mismanagement of the country’s AIR. PS- doubling the (already mislabeled) “safe limit” does not in fact make things any better. Really?and what did all of the previous governments do about it? Fixing this problem(and many others also)has to come from within,theThai people themselves have to realise things need to change in many ways over here but it will take time.No election is going to fix this. 2.5 millimeters... really? Maybe The Nation should hire better proofreaders. On my friends air purifier in house at base of Doi Suthep reading showing 338! She has a young baby whose lungs are already being poisoned by other Thais selfishness and Government inaction. The majority of Thais live amidst filth and squalor, and rather than do something about it they prefer to sleep or play. Their choice, we can always leave. A joke of a newspaper for many years now.